Over a record 27-year baseball career that spanned four decades: 1966, 1968–1993, Ryan pitched for the New York Mets, California Angels, Houston Astros, and Texas Rangers. He was inducted into the Baseball Hall of Fame in 1999. Ryan, a hard-throwing, right-handed pitcher, threw pitches that were regularly clocked above 100 miles per hour (161 km/h). He maintained this velocity throughout his career, even into his 40s. Ryan was also known to throw a devastating 12–6 curveball at exceptional velocity for a breaking ball. Ryan had a lifetime winning percentage of .526, and he was an eight-time MLB All-Star. His 5,714 career strikeouts is an MLB record by a significant margin. He leads the runner-up, Randy Johnson, by 839 strikeouts. Similarly, Ryan's 2,795 bases on balls lead second-place Steve Carlton by 962—walking over 50% more hitters than any other pitcher in MLB history. Ryan, Pedro Martínez, Randy Johnson, and Sandy Koufax are the only four pitchers inducted into the Baseball Hall of Fame who had more strikeouts than innings pitched. Besides Jackie Robinson (whose number was retired by Major League Baseball) and Frank Robinson (3 teams), Ryan is the only other major league baseball player to have his number retired by at least three teams: the Angels, Astros, and Rangers. 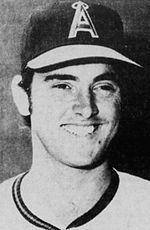 Ryan was born in Refugio, south of Victoria in south Texas, the youngest of six children, to Lynn Nolan Ryan Sr. (1907–1970), and the former Martha Lee Hancock (1913–1990). The senior Ryan operated a newspaper delivery service for the Houston Post that required him to rise in the early morning hours to prepare 1,500 newspapers for delivery over a 55-mile route. The children were expected to help with the daily tasks. Ryan's family lived in nearby Woodsboro in Refugio County, until they moved to Alvin in Brazoria County, when Nolan was six weeks old. As a young boy, Nolan enjoyed throwing objects at any target. His father thought baseball a better usage for his arm; therefore, he encouraged Nolan to play the game. Ryan joined Alvin Little League Baseball when he was nine, made the all-star team when he was 11 and 12, and pitched the first no-hitter of his life a few years later. Ryan also played various positions besides pitcher. Ryan played baseball for Coach Jim Watson at Alvin High School for all of his high school career. Ryan held the school's single game strikeout record for 44 years, striking out 21 hitters in a 7-inning game. The record was eventually tied by Alvin High School pitchers Aaron Stewart and Josh Land in the same week in 2009. In 1965, after graduating from Alvin High School, Ryan was drafted by the New York Mets in the 12th round of the 1965 Major League Baseball draft. He was assigned to the minor league Marion Mets in the Appalachian League. When Ryan was called up to the New York club the following year, he was the second-youngest player in the league. His first strikeout was Pat Jarvis, and he gave up his first major league home run to Joe Torre, a future NL MVP and Hall of Fame big-league manager. Ryan missed much of the 1967 season due to illness, an arm injury, and service with the Army Reserve; he pitched only 7 innings for the Mets' minor league affiliate in Jacksonville. In the 1968 season, Ryan returned to stay in the major leagues, until his retirement. Ryan was unable to crack the Mets' pitching rotation, led by Tom Seaver and Jerry Koosman. Ryan was used more as a reliever and spot starter by the 1969 Mets. To deal with frequent blisters on his throwing hand he often soaked his fingers in pickle brine, although the technique's effectiveness was questioned by Ryan's teammates and coaches. Ryan pitched well for the Miracle Mets in the 1969 postseason. Against the Braves in the NLCS, Ryan completed a Mets sweep by throwing seven innings of relief in Game 3, getting his first playoff win (it would take him 12 years to get another). Then in the 1969 World Series, Ryan saved Game 3, pitching 2⅓ shutout innings against the Baltimore Orioles. The Game 3 victory gave the Mets a 2–1 lead in the Series, which they went on to win in five games. It would be Ryan's only World Series appearance in his career. On April 18, 1970, Ryan tied a Mets record by striking out 15 batters in one game. Four days later, Ryan's teammate, Tom Seaver, topped it with a then MLB record 19 against the San Diego Padres (though Ryan would tie this record four years later). Ryan has credited his time with Seaver and the Mets with turning him from just a flamethrower to a pitcher. Contrary to popular belief, Ryan never wanted to be traded from the Mets and felt betrayed by the team that drafted him. His views on this only calmed once he started running the Rangers and gained a better understanding of the business side of baseball. Nolan Ryan's number 30 was retired by the California Angels in 1992. In his first season with the Angels, Ryan was given a chance to pitch regularly as a starter for the first time in his career, mainly because by then he had fulfilled his military obligation and no longer had to commute to Houston every other week. He had a league-leading 329 strikeouts—nearly a third more than the AL runner-up, and to that point, the fourth-highest total of the 20th century. Within five seasons, the season would only be Ryan's fourth-highest strikeout total. He also set a still-standing Major League record by allowing only 5.26 hits per nine innings, breaking Luis Tiant's 5.30 in 1968, as well as posting a 2.28 earned run average that year, to date the second lowest in franchise history, trailing only Dean Chance's 1.65 in 1964. Though Ryan's actual winning percentage hovered only slightly over .500, his strikeouts and no-hitters brought him media attention. Meanwhile, Fregosi failed to produce as a Met, making no significant contribution to the Mets' 1973 pennant-winning campaign; he was sold to the Texas Rangers mid-season. Although the Angels were a sub-.500 team and remained one for much of his time there, Ryan managed to post some winning records, notably 19–16 in 1972, 21–16 in 1973 and 22–16 in 1974 (the 22 wins tied what remains the Angels franchise record, set by Clyde Wright in 1970). He finished 2nd in the Cy Young balloting (losing to Jim Palmer 88 to 62) in 1973. It was the closest he ever came in the Cy Young balloting. Ryan also led the league in losses in 1976 with a 17–18 record (one short of the franchise record for losses). In the early 1970s, many teams used a four-man rotation and expected the starter to complete the game; thus most games Ryan started ended in a decision. In 1973, Ryan set his first major record when he struck out 383 batters in one season, beating Sandy Koufax's old mark by one. Remarking on this feat, Koufax joked, "Yeah, and he also surpassed my total for bases on balls in a single season by 91. I suspect half of those guys he struck out swung rather than get hit." Ryan threw two no-hitters in 1973. In the second one, on July 15 against the Detroit Tigers, he struck out 17 batters – most in a recorded no-hitter. (This record would later be tied by Max Scherzer on October 3, 2015.) Ryan was so dominant in this game, it led to one of baseball's best-remembered pranks. Tigers first baseman and cleanup hitter Norm Cash came to the plate with two outs in the bottom of the ninth, having already struck out twice, and was carrying a clubhouse table leg instead of a bat. Plate umpire Ron Luciano ordered Cash to go back and get a regulation bat, to which Cash replied, "Why, I won't hit him anyway!" With a regulation bat in hand, Cash did finally make contact, but popped out to end the game. During a September 7, 1974 game against the Chicago White Sox at Anaheim Stadium, Ryan became the first Major League pitcher to have his pitch speed measured during a game. A primitive radar gun clocked a ninth inning fastball at 100.8 miles per hour (162.2 km/h) when it was 10 feet (3.0 m) in front of home plate. This exceeded an earlier pitch by Bob Feller which was measured at 98.6 miles per hour (158.7 km/h) at home plate and previously thought to be the fastest pitch ever recorded. Ryan added a third no-hitter in 1974 and a fourth in 1975, tying another of Koufax's records. In 1974 he twice struck out 19 batters, tying Tom Seaver and Steve Carlton for the single-game record for a nine-inning game. Roger Clemens would become the first pitcher with a 20-strikeout game in 1986. The California Angels finally made the playoffs in Ryan's eighth and final year there in 1979. He started Game 1 of the ALCS and threw seven innings against the Orioles' Jim Palmer, but neither man was involved in the decision as Baltimore won in the 10th inning. Ryan was scheduled to pitch Game 5, but the Angels were eliminated in four. The season complete, Ryan became a free agent. Ryan led the American League in strikeouts seven times during his eight seasons with the Angels, but he also led the league in walks in six of those years, and finished second the other two seasons: 1975 and 1979. Aside from Bob Feller in 1938, Ryan is the only man since 1900 to walk 200 batters in a season, which he did twice: in 1974 and 1977. Though Ryan's strikeouts and no-hitters got him considerable media attention, he did not win over Angels general manager Buzzie Bavasi, who dismissed him as a flashy .500 pitcher (Ryan was 26–27 in the last two years he was with the Angels). Nolan Ryan's number 34 was retired by the Houston Astros in 1996. In 1980 Nolan Ryan became the first million dollar player when he signed a four-year free agent contract with the Houston Astros for one million dollars per season. The salary quadrupled what he had been making with the California Angels. The normally light-hitting Ryan got his Houston years started with a bang in a nationally televised game against the Los Angeles Dodgers on April 12, 1980, when he hit a three-run home run off Don Sutton. It was the first of two homers in Ryan's career and produced half of the six RBI he would get that year. On July 4 of that season, at Riverfront Stadium, Ryan recorded his 3,000th career strikeout, the victim being César Gerónimo of the Cincinnati Reds (Gerónimo had also been Bob Gibson's 3,000th strikeout victim, in 1974). Ryan got his third taste of postseason play in 1980, but the Astros were stopped one game short of the World Series. 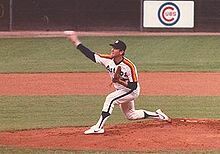 In the 1980 NLCS versus the Philadelphia Phillies, Ryan pitched well in Game 2, leaving the game tied 2–2 in the seventh (having contributed to both Astros runs with a run scored following a walk, and a sacrifice bunt leading to a run) but again got a no decision in a game that went extra innings. In the fifth and final game of the series, Ryan and the Astros held a 5–2 lead entering the 8th inning. But Ryan allowed three consecutive singles before walking in the third run. The Houston bullpen allowed the Phillies to take a 7–5 lead, and only a game-tying Astro rally permitted Ryan to escape the loss. On September 26, 1981, Ryan threw his fifth no-hitter, breaking Koufax's mark while becoming the third pitcher to throw a no-hitter in each league. That season, his 1.69 ERA won the National League ERA title. Facing the Los Angeles Dodgers in the 1981 NLDS, Ryan threw a complete game 2-hitter in the opener, outlasting the Dodgers' rookie sensation Fernando Valenzuela. It was Ryan's second and last career postseason win. In the fifth and final game of the series, Ryan left trailing 3–0 and took the loss. By the end of the 1982 season, both Ryan and Steve Carlton were approaching Walter Johnson's all-time strikeout record, sometimes passing one another's career totals in successive starts. On April 27, 1983, Ryan won the race with his 3,509th whiff, against Brad Mills of the Montreal Expos. (Carlton would reach the same mark two weeks after Ryan, and Gaylord Perry did so later that season.) On July 11, 1985, Ryan struck out Danny Heep for his 4,000th career strikeout. 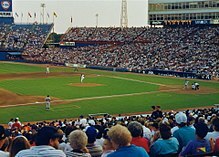 In 1986, Ryan's Astros faced the New York Mets in the National League Championship Series. Ryan had a shaky start in Game 2, taking the loss. He returned in Game 5, throwing 9 innings of 2-hit, 1-run, 12-strikeout ball, but one of those hits was a Darryl Strawberry home run which tied the game at 1–1, as Dwight Gooden matched Ryan pitch for pitch. Ryan got a no-decision as his Astros lost in 12 innings. In 1987, Ryan led the major leagues in both ERA (2.76) and strikeouts (270) at the age of 40—but finished 8–16 as the result of extremely poor run support. Despite his .333 winning percentage, Ryan tied for 5th place in the 1987 Cy Young voting. Ryan hit his second and last career home run in a 12-3 win on May 1, 1987, against the Atlanta Braves. Nolan Ryan's number 34 was retired by the Texas Rangers in 1996. Ryan left Houston in a contract dispute following the 1988 season and joined the Texas Rangers. He became the first player to play for all four MLB original expansion teams: the Mets, Angels, Houston Colt .45s/ Astros and Washington Senators/Texas Rangers. (Ryan would be joined in this category by Darren Oliver, who made his major league debut as Ryan's teammate in September 1993. Oliver's father Bob had also been a teammate of Ryan's, with the Angels from 1972 to 1974.) In 1989, he went 16–10 and led the league with 301 strikeouts. Against the Oakland Athletics on August 22, Ryan struck out Rickey Henderson to become the only pitcher to record 5,000 career strikeouts. (Following the game, Henderson was quoted as saying, "If he ain't struck you out, then you ain't nobody.") His 4,999th and 5,001st strikeouts were against the same man, Athletics catcher Ron Hassey. Two years later, at 44, Ryan finished fifth in the league in ERA (2.91) and third in strikeouts (203). In 1990, Ryan threw his sixth no-hitter on June 11 against the Athletics, and earned his 300th win on July 31 against the Milwaukee Brewers. On May 1, 1991, he set a record by throwing the seventh no-hitter of his career, striking out Roberto Alomar of the Toronto Blue Jays for the final out. On August 6, 1992, Ryan had the first and only ejection of his career when he was ejected after engaging in a shouting match with Oakland Athletics outfielder Willie Wilson with 2 outs in the 9th inning. Before the 1993 season began, Ryan announced that he would retire as a player at the end of that season. On August 4, just before the end, Ryan had yet another high-profile moment—this time an on-the-mound fight. After Ryan hit Robin Ventura of the Chicago White Sox with a pitch, Ventura charged the mound in order to fight Ryan, who was 20 years his senior. Ryan secured the 26-year-old Ventura in a headlock with his left arm, while pummeling Ventura's head with his right fist six times before catcher Iván Rodríguez was able to pull Ventura away from Ryan. Ryan stated afterwards it was the same maneuver he used on steers he had to brand on his Texas ranch. Videos of the incident were played that evening throughout the country. While Ventura was ejected, Ryan–who had barely moved from his spot on the mound in the fracas–was allowed to remain in the game. White Sox manager Gene Lamont vehemently argued this, leading to his own ejection. Ryan pitched a hitless ball game the rest of the way. He had determined to be more aggressive after coming out on the wrong side of an altercation with Dave Winfield in 1980. Ryan's arm gave out in Seattle on September 22, 1993, when he tore a ligament. The injury ended his career two starts earlier than planned. Ryan briefly attempted to pitch past the injury, and he threw one additional pitch after tearing his ligament. With his injured arm, his final pitch was measured at 98 miles per hour (158 km/h). Ryan's last start was his career worst; he allowed a single, four walks, and a grand slam in the top of the first without recording an out. It was his record-setting 10th grand slam given up of his career. (Ryan left trailing 5–0, and the fourth walk was completed by a reliever after Ryan's injury, but credited to Ryan.) Greg Myers of the California Angels was the last strikeout victim of Nolan Ryan's career, on September 17, 1993. Ryan finished his career having played in a major league record 27 seasons. He was the final active player from the 1960s to retire from Major League Baseball, outlasting Carlton Fisk (the final active position player) by three months. Ryan threw a record seven no-hitters during his major league career, three more than any other pitcher. The no-hitters spanned three decades of pitching. In those seven games, Ryan accumulated a total of 94 strikeouts and 26 walks; a ratio of 3.6 strikeouts per walk (his career K:BB was 2.0). Ryan struck out 17 in his no-hitter on July 15, 1973 versus Detroit and walked eight in his subsequent no-hitter against Minnesota, both respective highs for his no-hitters. Nolan Ryan's post-retirement business interests include ownership of two minor league teams: the Corpus Christi Hooks, which play in the Class AA Texas League, and the Round Rock Express, a Class AAA team in the Pacific Coast League. Both teams were affiliates of the Houston Astros, for whom Ryan also served as a special assistant to the general manager until selling his interest in the team in the off-season between 2004 and 2005. He became the president of the Texas Rangers in 2008. He became the Rangers' AAA affiliate beginning in 2010; the Hooks are still the Astros' AA affiliate and were purchased by the Astros in 2013 when Nolan's son, Reid Ryan, took office as President of the Houston Astros. Ryan threw out the ceremonial first pitch before Game 3 of the 2005 World Series between the Astros and the White Sox, the first World Series game ever played in Texas. That game went 14 innings, equaling the longest in innings in World Series history (at 5:41, it was the longest in time). ESPN wryly suggested the Astros might have needed to pull the 58-year-old Ryan out of retirement if the game had gone much longer. Ryan has co-written six books: autobiographies Miracle Man (with Jerry Jenkins, 1992), Throwing Heat (with Harvey Frommer, 1988) and The Road to Cooperstown (with Mickey Herskowitz and T.R. Sullivan, 1999); Kings of the Hill (with Mickey Herskowitz, 1992), about contemporary pitchers; and instructional books Pitching and Hitting (with Joe Torre and Joel Cohen, 1977), and Nolan Ryan's Pitcher's Bible (with Tom House, 1991). In addition to his baseball activities, Ryan was majority owner and chairman of Express Bank of Alvin but sold his interest in 2005. He also owned a restaurant in Three Rivers, Texas. He served on the Texas Parks and Wildlife Commission from 1995 to 2001. He appeared as a TV spokesman for Advil for several years, promoting the pain medication he recommended for his own arm. He also has appeared in various television commercials shown in the Texas market. After retiring from baseball, Ryan teamed up with the federal government to promote physical fitness. His likeness was used in the "Nolan Ryan Fitness Guide", published by The President's Council on Physical Fitness and Sports in 1994. Ryan suffered a heart attack on April 25, 2000, and had to receive a double coronary bypass. In February 2008, the Rangers hired Ryan as team president. After the 2009 season, Ryan and Chuck Greenberg submitted a bid to purchase the Rangers from owner Tom Hicks. At midnight on August 5, 2010, the Ryan/Greenberg group, Rangers Baseball Express, was announced as the winners of the final auction to purchase the Rangers, after final approval from Major League Baseball. The final cash bid to purchase the franchise was $385 million. The opposing high bidder was Dallas Mavericks owner Mark Cuban. Greenberg became managing general partner and CEO, while Ryan remained as team president. Greenberg left the group in March 2011, reportedly due to a philosophical clash with Ryan. Ryan was immediately named as CEO while keeping the title of president. Although Texas oil magnates Ray Davis and Bob Simpson served as co-chairmen and held larger stakes, Ryan became the undisputed head of the franchise, with Davis and Simpson serving mostly as senior consultants. Ryan was named the Dallas-Fort Worth's 2012 CEO of the Year by Southern Methodist University's Cox School of Business. During the baseball owners' meetings in Scottsdale, Arizona, on March 1, 2013, the Rangers announced that general manager Jon Daniels would add president of baseball operations to his title. Rick George was promoted to president of business operations. Ryan's title was changed simply to CEO, but he remained operating head of the franchise; both Daniels and George reported to him. On October 17, 2013, Ryan announced that he was stepping down as Rangers CEO effective October 31, 2013. On February 11, 2014, Ryan accepted a position as a special assistant to Astros owner Jim Crane. Ryan played in more seasons (27) than any other player in modern (since 1900) major league history. Ryan ranks first all-time in strikeouts (5,714), fewest hits allowed per nine innings (6.56), and no-hitters (7). He is also fifth in innings pitched (5,386), second in games started (773), seventh in shutouts (61) and is tied for 14th in wins (324). Opposing hitters hit only .204 against Ryan during his career, though they had a .309 on-base percentage against him. He also limited hitters to a .298 slugging percentage. Ryan had 15 or more strikeouts in a game 26 times, second only to Randy Johnson, who had 28. Ryan's lengthy career spanned generations as he struck out seven pairs of fathers and sons (for example, Bobby Bonds and Barry Bonds), another major league record. Ryan also played during the administrations of seven U.S. Presidents—Lyndon B. Johnson, Richard M. Nixon, Gerald Ford, Jimmy Carter, Ronald Reagan, George H. W. Bush, and Bill Clinton—equaling a 20th-century record that had been set by Jim Kaat. Ryan also ranks high on the list for four "negative" records; he ranks first all-time in walks allowed (2,795), first in wild pitches (277), third in losses (292—most in the post-1920 live-ball era), and ninth in hit batters (158). Ryan was the first pitcher in MLB history to give up ten grand slam home runs, including one to Dann Howitt, the next-to-last batter Ryan faced in his career; he has since been surpassed. Other writers have delved more into the specifics of James' general concerns. ESPN writer Rob Neyer stated in a 2003 column that while Ryan was among the 20 best pitchers since World War II, he "often had trouble throwing strikes, [and] he wasn't any good at fielding his position". In another column, Neyer, while stating that Ryan belonged in the Hall of Fame, pointed to Ryan's record-breaking walks total and noted that his .309 on-base percentage against "wasn't even close to being in the top 100". Ryan and Frank Robinson are the only two major league players to have their number retired by three teams on which they played. The California Angels (now the Los Angeles Angels) retired the number 30 on June 16, 1992; the Texas Rangers retired his number 34 on September 15, 1996; and the Houston Astros retired number 34 on September 29, 1996. His number was the first retired by the Rangers. He is also one of only nine players to have had their numbers retired by more than one MLB team, with Carlton Fisk (Red Sox and White Sox), Reggie Jackson (Athletics and Yankees), Rollie Fingers (Brewers and Athletics), Hank Aaron (Brewers and Braves), Greg Maddux (Braves and Cubs), Frank Robinson (Reds, Orioles and Indians), Rod Carew (Twins and Angels), and Jackie Robinson (All MLB) being the others. Two managers, Casey Stengel (Yankees and Mets) and Sparky Anderson (Reds and Tigers) also had their numbers retired by more than one team. Ryan was elected to the Baseball Hall of Fame in 1999, in his first year of eligibility with 98.79% of the vote (491 out of 497 possible), six votes short of a unanimous election and the fourth-highest percentage in history, behind Mariano Rivera (100%, 425 out of 425 possible), Ken Griffey Jr. (99.32%, 437 out of 440 possible), and Tom Seaver (98.84%, 425 out of 430 possible). He chose to wear a Rangers cap for his HOF plaque to reflect his Texas heritage, as well as the fact that his 300th win, 5000th strikeout, and last two no-hitters came as a Ranger. He was the first Hall of Famer inducted as a Ranger. However, the Hall of Fame recognizes the Los Angeles Angels as his primary team. That year, he ranked 41st on The Sporting News list of the 100 Greatest Baseball Players and was elected to the Major League Baseball All-Century Team. He was inducted into the Texas Rangers Hall of Fame in 2003, and named the Rangers', and Astros' Hometown Hero in 2006—the only player to be so named by two franchises. In 2011, he was inducted into the Irish American Baseball Hall of Fame. In 1992 the United States Mint produced a $1 commemorative coin honoring Olympic baseball depicting a pitcher in a USA Baseball uniform, but in a pose nearly identical to Ryan's photo on his 1991 Fleer baseball card. The numismatic community subsequently referred to the coin as the "Nolan Ryan dollar." In 1995 the Texas State Legislature declared State Highway 288, which passes near Alvin, as the Nolan Ryan Expressway. The Alvin Independent School District opened Nolan Ryan Junior High School, located at 11500 Shadow Creek Parkway (FM 2234) in Pearland, Texas, just a few hundred yards away from the Nolan Ryan Expressway. Ryan married his high school sweetheart, the former Ruth Holdorff, on June 25, 1967. They have three children, Reid, Reese, and Wendy. Reid and Reese were both pitchers for the TCU Horned Frogs. Reid also pitched briefly in the minor leagues. On May 17, 2013, Reid was announced as president of the Houston Astros. 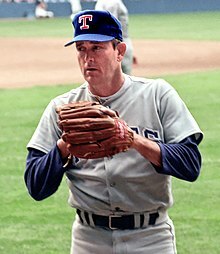 Nolan Ryan resides in the Cimarron Hills community in Georgetown, a suburb of Austin. Though he supported Jimmy Carter over Gerald R. Ford Jr. in 1976, Ryan has since been an ardent Republican. In 1996 Ryan campaigned on behalf of Ron Paul in the election for Texas's 14th congressional district; his hometown of Alvin was located in the district. On April 7, 2011, Todd Staples announced that Nolan Ryan would be his statewide chairman for his exploratory committee for lieutenant governor. Ryan is quoted as saying, "Todd Staples is the top prospect for the Texas Republican Party in 2014." Staples, however, lost out in that race to current Lieutenant Governor Dan Patrick of Houston. ^ a b c d e f g h i j k l m n o p q Pitching Splits and Daily Pitching Logs at Retrosheet and Baseball-Reference.com. ^ Bill James; Rob Neyer (2004). The Neyer/James Guide to Pitchers. New York: Fireside. pp. 382–383. ISBN 0-7432-6158-5. ^ Ryan, Nolan; Frommer, Harvey (1988). Throwing Heat: The Autobiography of Nolan Ryan. New York: Doubleday. ISBN 0-385-24438-X. ^ "Lynn Nolan Ryan Sr". Findagrave.com. Retrieved January 4, 2017. ^ The senior Lynn Ryans are interred at Confederate Cemetery in Alvin, Texas. ^ Miracle Man: Nolan Ryan: The Autobiography, with Jerry Jenkins, Thomas Nelson Publishers, 1992, ISBN 0-8499-0945-7, pp. 33, 65, 66. ^ a b "Nolan Ryan, The Man". Nolanryan.net. Retrieved September 1, 2013. ^ Sanna, Ellyn (2003). Nolan Ryan. The Rosen Publishing Group. ISBN 0-8239-3601-5. ^ "Nolan Ryan Foundation Entry Page". Nolanryanfoundation.org. Archived from the original on September 17, 2013. Retrieved September 1, 2013. ^ "Nolan Ryan infosite". Encyclopedia.com. Retrieved September 1, 2013. ^ "D Magazine – Dallas Guide to Restaurants, Nightlife, Things to Do, Shopping, Politics, and Culture. Find all the best Dallas has to offer". Insidecorner.dmagazine.com. Archived from the original on January 27, 2013. Retrieved September 1, 2013. ^ "Nolan Ryan Strikeout Record Broken! – Alvin High School Baseball". Alvinbaseball.org. December 7, 2011. Retrieved September 1, 2013. ^ "The Ballplayers – Nolan Ryan". BaseballLibrary.com. Archived from the original on December 23, 2010. Retrieved March 12, 2011. ^ a b c "Nolan Ryan Stats - Baseball-Reference.com". Baseball-Reference.com. Retrieved December 7, 2017. ^ "What a Day For Tom Seaver". Meriden Journal. Associated Press. April 23, 1970. Retrieved April 18, 2011. ^ "The Kult Of Mets Personalities – Nolan Ryan/Kris Benson 03/14 by Ivie League Prod". Blogtalkradio.com. March 14, 2012. Retrieved September 1, 2013. ^ Burman, Howard (December 18, 2012). "Season of Ghosts: The '86 Mets and the Red Sox". McFarland. Retrieved December 7, 2017 – via Google Books. ^ ""Tiger first baseman Norm Cash." Baseball Digest, 2001". Findarticles.com. July 15, 1973. Archived from the original on July 8, 2012. Retrieved March 12, 2011. ^ McLemore, Ivy. "Ryan strikes out 11, sails past 4000". Astros Daily. Retrieved July 24, 2018. ^ Moran, Malcolm (August 2, 1990). "Ryan Savors His Milestone With a Feeling of Relief". The New York Times. ^ Freeman, Denne H. (August 5, 1993). "Raging Ryan Strikes Ventura". Austin American-Statesman. p. C1. ^ "May 15, 1973 California Angels at Kansas City Royals Box Score and Play by Play". Baseball-Reference.com. May 15, 1973. Retrieved September 1, 2013. ^ "July 15, 1973 California Angels at Detroit Tigers Box Score and Play by Play". Baseball-Reference.com. July 15, 1973. Retrieved September 1, 2013. ^ "September 28, 1974 Minnesota Twins at California Angels Play by Play and Box Score". Baseball-Reference.com. September 28, 1974. Retrieved September 1, 2013. ^ "June 1, 1975 Baltimore Orioles at California Angels Box Score and Play by Play". Baseball-Reference.com. June 1, 1975. Retrieved September 1, 2013. ^ "September 26, 1981 Los Angeles Dodgers at Houston Astros Box Score and Play by Play". Baseball-Reference.com. September 26, 1981. Retrieved September 1, 2013. ^ "June 11, 1990 Texas Rangers at Oakland Athletics Play by Play and Box Score". Baseball-Reference.com. June 11, 1990. Retrieved September 1, 2013. ^ "May 1, 1991 Toronto Blue Jays at Texas Rangers Box Score and Play by Play". Baseball-Reference.com. May 1, 1991. Retrieved September 1, 2013. ^ "Texas United Bancshares agrees to buy Nolan Ryan family's bank". San Antonio Business Journal. October 27, 2005. ^ "The President's Council on Physical Fitness and Sports – Publications". Fitness.gov. Retrieved March 12, 2011. ^ Grant, Evan (February 6, 2008). "Nolan Ryan hired as Texas Rangers' president". Dallas Morning News. Retrieved April 3, 2010. ^ Sullivan, T.R. (March 11, 2010). "Greenberg leaves Rangers; Ryan named CEO". MLB.com. ^ Wills, Todd (May 24, 2013). "Ray Davis, Bob Simpson to continue as low-key counsel for Texas Rangers | texasrangers.com: News". Texas.rangers.mlb.com. Archived from the original on September 21, 2013. Retrieved September 1, 2013. ^ Curry, Kerry (December 2012). "CEO of the Year: Nolan Ryan". Dmagazine.com. Retrieved September 1, 2013. ^ Wilson, Jeff (March 1, 2013). "Rangers promote Jon Daniels to president of baseball operations". Fort Worth Star-Telegram. Retrieved October 17, 2013. ^ Fraley, Gerry (October 17, 2013). "Nolan Ryan to retire as Texas Rangers CEO on Halloween". The Dallas Morning News. Retrieved October 17, 2013. ^ "Nolan Ryan to return to Astros as special assistant to Jim Crane". Houston Chronicle. February 11, 2014. Retrieved February 11, 2014. ^ "The Nolan Ryan Express | The Strikeout King | smackbomb.com/nolanryan". Smackbomb.com. Archived from the original on July 16, 2011. Retrieved March 12, 2011. ^ Kurkjian, Tim (October 4, 1993). "Nolan Ryan". Sports Illustrated. Retrieved April 16, 2019. ^ James, Bill. "The New Bill James Historical Baseball Abstract": 862. ^ Rob NeyerESPN.com (May 27, 2003). "No mention of Ryan brings plenty of disbelief". ESPN.com. Retrieved March 12, 2011. 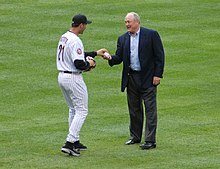 ^ "Nolan Ryan: why he's overrated". ESPN.com. September 16, 1999. Retrieved March 12, 2011. ^ Sullivan, T.R. (March 11, 2019). "Texas Rangers Retired Numbers". Major League Baseball. Retrieved April 16, 2019. ^ . MLB Hall of Fame website. Retrieved September 28, 2018. ^ Bios Of The Inductees. Irish American Baseball Hall of Fame website. Retrieved February 23, 2014. ^ "1992 Olympic Baseball". deecken.com. Retrieved December 7, 2017. ^ "Did the United States produce a Nolan Ryan Dollar coin?". Retrieved December 7, 2017. ^ "Texas Memorial Highway System". Texas Department of Transportation. Retrieved April 16, 2019. ^ "Nolan Ryan Jr. High". Alvin ISD. Retrieved April 16, 2019. ^ Smith, Claire (April 3, 1991). "As Texas Watches, Ryan Hurls Against Ryan". New York Times. Retrieved September 3, 2009. ^ "Nolan Ryan's Oldest Son Named Astros President". WBBM-TV. May 17, 2013. Retrieved May 18, 2013. ^ Caldwell, Christopher (July 22, 2007). "The Antiwar, Anti-Abortion, Anti-Drug-Enforcement-Administration, Anti-Medicare Candidacy of Dr. Ron Paul". New York Times. Retrieved September 3, 2009. ^ "Press Releases". April 7, 2011. Retrieved September 4, 2013. ^ "PRESS RELEASE: Nolan Ryan to Serve as Statewide Chairman for Staples" (PDF). April 7, 2011. Retrieved September 4, 2013. James, Bill (2001). The New Bill James Historical Baseball Abstract. New York: Free Press. Pietrusza, David; Silverman, Matthew; Michael Gershman (2000). Baseball: The Biographical Encyclopedia. Total/Sports Illustrated. Wikimedia Commons has media related to Nolan Ryan.